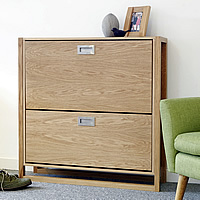 Stylish high quality wooden 2 drawer shoe cabinet with a choice of Oak or Walnut detailing. Will store up to 10 pairs of shoes. 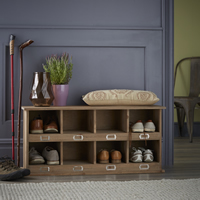 Stylish solid wooden 2-drawer shoe storage cabinet in a choice of Oak or Walnut. Holds up to 20 pairs of shoes. 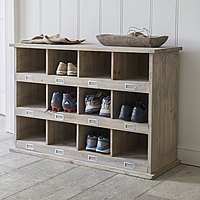 A quality piece of furniture for the entryway or bedroom and a great shoe storage solution. 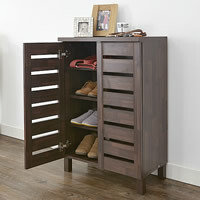 Stylish wooden 2-drawer shoe storage cabinet in an oak finish. Holds up to 12 pairs of shoes with space to sit. Traditional wooden hallway bench with wicker storage baskets beneath for shoes etc. Clear your entryway of the families clutter. Three seater traditional wooden hallway bench in a lovely clay colour and finished with three square wicker storage baskets beneath for shoe storage etc. 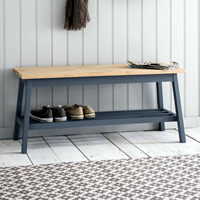 Stylish oak and charcoal painted beech wood hallway bench with shoe shelf below. 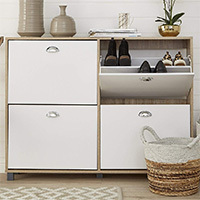 Perfect for decluttering hallways, utility rooms and boot rooms. 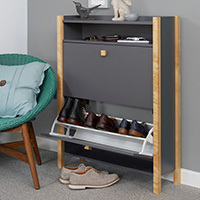 Stylish high quality wooden 2 drawer shoe cabinet finished in dark grey with oak detailing. Will store up to 20 pairs of shoes. 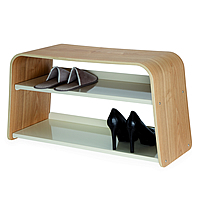 Contemporary shoe storage cupboard which can hold up to 12 pairs of shoes. 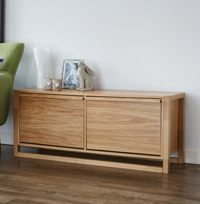 Crafted from solid oak and delivered fully assembled. Set of 3 wooden modular storage cubes available in a white or oak finish with 2 large reinforced fibreboard boxes. Ideal for using in the hallway by the door to clear away shoes, hats, scarves etc. 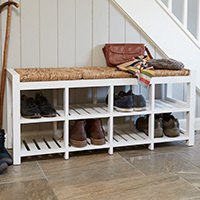 Scandi-inspired white and solid wood flip top storage bench with 2 internal compartments for shoes and a storage shelf below. 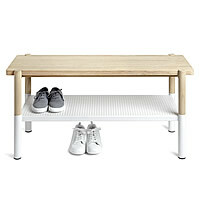 Simple and stylish Scandi inspired ashwood and white metal shoe bench. Holds 4-8 pairs of shoes whilst offering a place to sit. 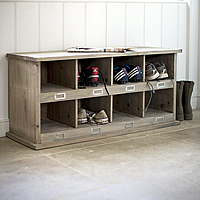 FirSpruce wood shoe storage locker with 8 cubbies for tidying away shoes and trainers. Ideal for using in the hallway, porch or boot room. 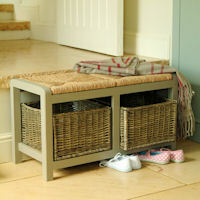 Classic three-drawer bench with extra storage space for shoes etc in three wicker baskets below. Ideal hallway shoe storage solution. 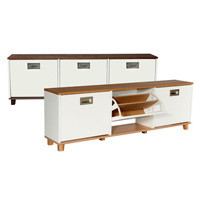 Set of 3 wooden modular storage cubes available in a white or oak finish with three large storage baskets. 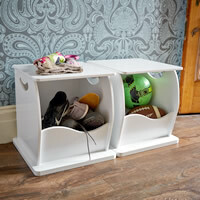 Ideal for using in the hallway by the door to clear away shoes, hats, scarves etc. 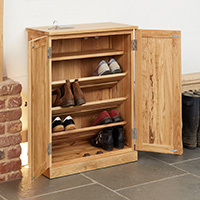 Spruce wood shoe storage locker with 8 cubbies for tidying away shoes and trainers Ideal for using in the hallway, porch or boot room. 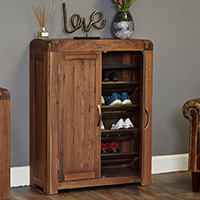 Solid walnut shoe cabinet which has been designed to hold up to 20 pairs of shoes. Delivered fully assembled. 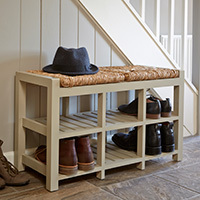 Our Classic three-drawer bench with extra storage space for shoes etc in three wicker baskets below is now available in this rustic lime washed finish. Ideal hallway shoe storage solution.